Zack De La Rocha was never straight edge, right? So, he must have never actually played lead guitar for Hard Stance, right? Riiiiiiiiight. Before he sang for Inside Out, and long before the commercially viable days of Rage Against The Machine, Zack played guitar for Hard Stance. 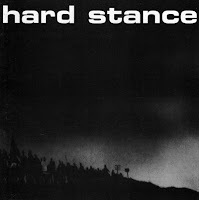 In the late 80s, Hard Stance were a great straight edge band that shared the stage with the likes of Insted, No For An Answer, Chain of Strength, Uniform Choice and many more. This cd compiles the two 7"s that Hard Stance put out. I'm not sure what they had as far as a demo, or any possible comp tracks, so I can't say for sure if this is a complete discography or not. However, I'm guessing they didn't do any remixing, or remastering for this cd, because the tracks sound pretty much exactly the same as they do on the two 7"s that I own. Thanks for posting Hard Stance - they were such an inspiration to me when I first started listening to Straight edge back in 92. Do you have Unit Pride's Then & Now compilation? Also, anything from Circle Storm? Thanks a ton! thx a lot 4 that! not great records but important history. There was a demo that, aside from the first song, wasn't that good.